It's A Dan's World: THE CRUNCH: What Comic/Film To See Next After Iron Man 2? THE CRUNCH: What Comic/Film To See Next After Iron Man 2? Sure Iron Man 2 rocked the casbah, but when it comes to THE CRUNCH where to next in the world of comics or film? IN COMICS: Sure Black Widow, Iron Man, and the new Avengers books feature the IM2 stars, but new Iron-Fans need to check out IRON MAN: The Dragon Seed Saga. Done in the days when writer John Byrne would waltz onto a title, and do a run knocking the ball outta the hemisphere with every issue, Dragon Seed is killer stuff. 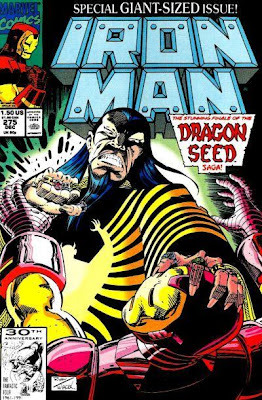 When the Chinese offer to fix Tony Stark's central nervous system hinges on having Iron Man rid their country of both Fing Fang Foom and The Mandarin, it takes two Iron Men (Stark and James Rhodes) to attempt it. I say 'attempt' because it's not just one dragon the Mandarin is in cahoots with, but the infants entire race. Hidden on Earth in human form for centuries, they are now ready to strike, and not even the unsuspecting Mandarin himself is safe. IN MOVIES: One word INCEPTION. I'm going to state it right now; Christopher Nolan, the director of Dark Knight has made what will be THE movie of the year - again. In an awesome move, INCEPTION's full plot was released in a second full trailer, hidden within an online game on the film's own promotional website. So I don't waste time trying to explain it all in a jumble of words, that bundle of espionage awesomeness is wrapped up for you right here on IADW (or at Yahoo Movies in HD), so you can see why in 2010, your mind will be the scene of the crime.